There’s something studiously quirky about the feature debut of Colin Trevorrow and writer Derek Connolly. Perhaps that’s because it’s based on a studiously quirky premise; an actual advert placed as a joke for a time travel companion, one that attracted bored column inches by many and varied media outlets. The movie’s only noteworthy feature is how consistently slight it is, and it’s mystifying how Safety Not Guaranteed got the duo the gig for the kick-starting of one of cinema’s biggest franchises. The premise has Seattle Magazine interns Darius (Aubrey Plaza) and Arnau (Karan Soni) sent with fully-fledged writer Jeff (Jake Johnson) to investigate a classified ad for a candidate to take part in a trip back through time; payment upon return, and weapons necessary (hence the title). Darius is the kind of self-involved-but-sharp-witted female protagonist beloved by Bryan Fuller (pre-Hannibal, at any rate). There’s something of the relentlessly perky, likeably offbeat quality of Wonderfalls and Dead Like Me to Safety Not Guaranteed, but it feels like it’s trying too hard for that kind of spirit. Whereas Fuller’s series were breezy, zippy and touching, Safety ends up treading over-familiar territory in an utterly undemanding fashion. Additionally, Ryan Miller’s incessantly one-note score seems bent on wearing the viewer out through ambling fluffiness. The makers are daring you not to give a stuff, so it’s hardly surprising if you don’t. Plaza is fine with her quick retorts, but there’s zero reason to believe she would fall for Mark Duplass’ mono-eared potential chrononaut Kenneth. And while Duplass (and his brother) has his fans (the fraternal duo are on board as executive producers) I tend to find their particular shtick rather grating; Kenneth’s self-motivating phraseology wears thin very quickly. Every story beat can be seen coming a mile off. There are even blatant steals from the vastly superior Repo Man. The little character arcs are banal (Arnau’s geeky shyness) or stodgy (Jeff hooking up with an old girlfriend). Johnson and Soni are fine, but their characters are tiresome. This is a short movie, but it feels longer chiefly because it has no momentum. It ambles along, remembering to insert the occasional set piece (a robbery, for example) to enliven matters. There’s the odd moment where the viewer is allowed to reach their own conclusions (the tin full of money for a possible former traveller, the idea that Kenneth might be telling the truth about the reasons for his trip as he might have actually succeeded) but the ending flattens out the ambiguity. Nice to see Curb Your Enthusiasm’s Jeff Garlin, who somehow manages to give lumbering dialogue a bit of heart. The easy-going tone also put me in mind slightly of Robot and Frank, another quirky low budget science fiction movie. But that one actually engineers some genuine pathos, and comes with affecting performances. 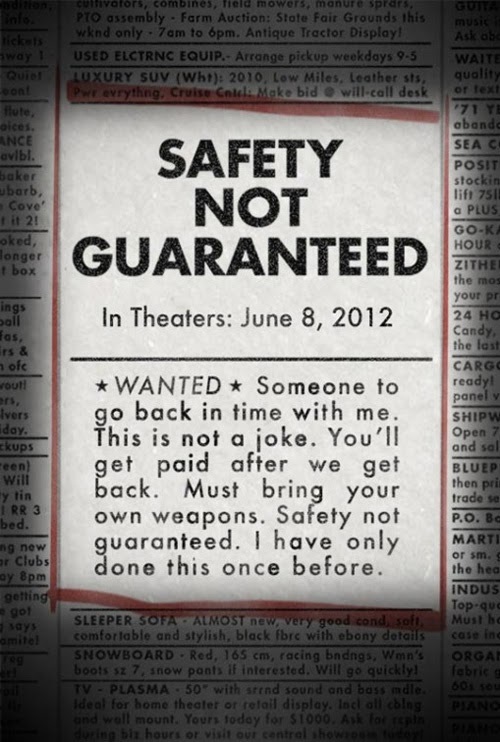 Safety Not Guaranteed ends up on the wrong side of twee, despite half-hearted attempts to inject a bit of vulgarity into the mix. As for how Trevorrow got the nod for Jurassic World? Count me uncomprehending. It’s not a great leap to see Gareth Edwards go from the micro-budget Monsters to the mega-budget Godzilla because they have something in common. And Marc Webb, well he made a movie about young people and has a spidery surname. Perhaps Jurassic World’s going to surprise us all by being a non-blockbuster in which we’re not sure if a crackpot scientist actually created dinosaurs until the last five minutes. I suppose at least that would break the formula of the previous sequels.